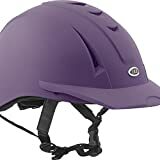 The best of the best on the list is the Troxel Spirit Riding Helmet. It has a good eye for quality and durability. Best for children and adults, this model comes with features that separate it from the rest of the competition. The GPS II dial fit system offers a form-fitting and comfortable fit through and through. It even features mesh covered vents for breathability and air circulation. So you do not feel crowded and sweaty while wearing it. In fact, it’s hard for other horse riding hat to match its blend of size, material, and availability. The Ovation Protege Helmet is complete leather and shine. It features extra-rugged adjustment teeth and an easy-to-adjust dial for a comfortable fit. Meanwhile, the high-flow ventilation system keeps you cool and dry throughout. All these features mark the Ovation Protege as one of the exclusive picks on the list. It also boosts the shelf life of the product. It slides on and off your head and is easy to clean. That’s exactly what you need from such a durable structure. 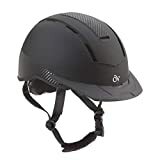 The Troxel Sport Schooling Helmet is the best bang for the buck. A good value as well as a high-quality buy for adults and children. It features an attached visor, a washable and removable headliner, and 7 distinctive cooling vents. The cooling vents are much exclusive to this model, offering incredible support and breathability. All these features, and much more, lead us to believe that the Troxel Sport Schooling is best for casual to intermediate riders. 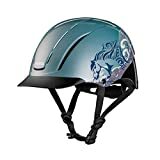 You might have read about the appealing appearance of a best horse riding helmet; especially if you’re interested in horseriding. But they’re not just for show. Horse riding helmets, certified and durable, can literally save your life against sudden throws and blows. The lack of such gear leaves you exposed to extreme riding temperatures, the sun, and other elements. So it’s only wise to opt for the best horse riding hat before anything else. The safest products are those that come tested and approved by the American Society of Testing and Material, or in short ASTM. These products are capable of withstanding sharp blows, drops, speed, and harness strength. So you wear materials that do not diminish under the sun and leave your head exposed to drops. Other safety standards are reviewed by Snell, Kitemark, Standards Australia, EN, or PAS. However, they’re approved more for casual horseback riding standards and not for competitive purposes. On the other hand, if you come across a gear which has the phrase “for dress only” or “apparel only” on it, it is not safe for use. They’re designed to be merely used as fashion accessories. Before you read a bit more about the best features of such horse riding gear, let’s look at the statistics of not using one. It’s almost impossible to compare the environment of a quiet and restful stable to that of a horserace. The visual differences are as much striking as the feel of it. So the truth is that you’re more likely to end up in a hospital due to a minor horseback accident, unless you opt for the right gear. And to say that horses are manageable, with correct training, is wrong. A sudden jerk or shift in movement can send you to the ground. So the unpredictability of horses, under any circumstance, is not to take lightly. So is relying on nothing but your instincts on how your horse communicates with you enough to risk your health? Why Don’t People Wear The Best Horse Riding Helmet? 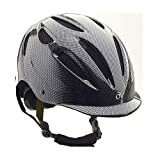 While many people prefer buying a best durable horse riding hat for their riding endeavors, some are willing to take the risk. Here are some of the reasons why you might not wear the best horse riding headgear for your safety. You’re confident about doing an emergency stop and dismount. While emergency dismounts and stops are excellent skills to master, they’re not your only hope in preventing head injuries. That said, they aren’t guaranteed ways to prevent collision. Falls and collisions happen so suddenly, most often than not there’s no time to prepare for it. If you think horse riding headgear will give you a headache, the problem is finding the right fit. There can be a lot other reasons why your head hurts during riding. It may be that you’re dehydrated or the hat is too tight for you. If you think the best horse riding hat will mess up your hair causing hair fall, use a conditioner to protect your hair from the sun. A good shampoo and hair-dryer can do much to protect your hair- as well as the horse riding hat. The best horse riding hats keep your head cool and dry rather than hot and sweaty. Traditionally speaking, many riders chose to go hatless for this reason. But latest discoveries in anti-sweat and therapeutic models, you can find a custom fit horse riding hat in the best condition and valuable price. Whether you’re buying a horse riding hat for yourself or as a gift for someone close, the right product- one that’s suited for safe use- is not that far away. You ought to know these significant features before making a final purchasing decision. What are helmets made up of and how? This questions an essential answer most horse riders need to know about. That said, it’s a simple answer with a simple way to understanding what you need to look forward to. The combination of all these significant components make up a horse riding hat’s safety system. And they’re responsible for protecting you, unless you wear it incorrectly or buy a product that’s missing any one of these components. With a better understanding of each component, selecting the perfect horse riding gear will get easier. A plastic/fiberglass outershell has two main safety properties. First, it makes sure that the hat can withstand the impact of sharp objects. This includes everything from sticks and rocks that are capable of penetrating through the hat and injuring your skull easily. Second, it absorbs the impact of a direct blow and distributes the blow throughout the hat rather than focusing on just one area of the head. This dispersion of impact is necessary as it doesn’t concentrate on one part of the hat. This could lead to severe traumatic brain injuries if left unchecked. The foam padding of the best horse riding hat offers cushioning and comfort. Traditionally, equestrian hats were sold without a cushiony foam padding. But now, given the way a product is manufactured and the increase in horseriding related injuries, it’s more important than ever. The inner shell of any equestrian hat must not feel hard against the skin. This is not desirable at all. And if you have such now, it’s time to upgrade to foam padding immediately. The fabric lining ensures all the internal components of the equestrian hat are together. If the internal fabric lining looks weakened, that means it needs to be replaced. Since the lining is what holds all other parts of the hat together, it also lets you know whether or not you need a brand-new equestrian hat. The last component, which is the polystyrene liner, is responsible for absorbing energy. This energy is generated by an impact. The polystyrene liner is made up of miniscule beads that crush together to prevent energy from penetrating the helmet. This protects your brain from crushing or bruising under lots of pressure from the impact. Many times when a high amount of energy hits your head, it leads to what we call a concussion. So instead of crushing your brain, this liner takes up the job of getting crushed instead for optimal protection. What we found in the Troxel Spirit Riding Helmet is well-priced and valuable. It’s known for its ease of use, great durability, and adjustability. With a striking GPS II Dial system, this best horse riding hat provides good enough flexibility with its mesh covered vents. Moving forward, the durable outer shell is safe for both children and adults. The graphic design on the hat is more geared towards children, however it features a rugged and unbreakable structure for everyone. 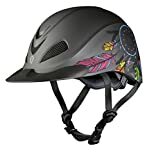 If there’s anything you need to take away from this is that the Troxel Spirit Riding Helmet is our go-to pick for the best horse riding hat. It comes in specific sizes, which makes it easy to buy. The only drawback to this pick is the plastic coating. It may not work for professional riders for endurance riding. However, you can start this one off as a good beginner horse riding hat for children and adults. The Ovation Protege Helmet is a lightweight and attractive hat. Once you buy the right size, it feels well on your head. The shiny carbon fiber design is light and looks more expensive than it is. This is one of the primary reasons why we love this equestrian headgear. It comes with fancy adjustments that are both ergonomic and effective. If you’re buying this for your kid, you should know that it offers plenty of room to breathe. It keeps the head cool and dry, especially during rodeo season. There’s plenty of room for making tweaks based on your head size and shape. The chin strap offers extra padding while the internal components offer plenty of ventilation. Our best under-budget pick is the Tipperary Sportage Equestrian Sport. This hat offers features that are both adjustable and rugged for wear. You can buy it in any season and you won’t feet too hot or too cool or too humid in it. For the price you pay, this is a good choice for most people. It fits a little snug and protects the head against constant wear and tear. If you’re a non-equestrian gear wearing person, the chin strap this hat comes with is comfortable enough for you. It doesn’t crowd your head. And neither does it feel too tight when you wear it for long hauls. The Tipperary Sportage Equestrian Sport Helmet is a good model for many reasons. One of them being that it features a durable yet comfortable padding with a lightweight fit. The high-density ABS quality offers extreme impact resistance, which most riders want. And the material is breathable with both top and rear vents. For adjustability, the sizing strap and flexible visor add better maneuverability to the frame. While it suits all head sizes. So if you’ve been searching for something striking and durable, consider buying this pick. It has quality and safety written all over it which is precisely the kind of blend you’d want. We found the Ovation Schooler Helmet to be one of the most authentic and anchored headgear in the market. With features that offer easy maneuverability, light stability, and superb air circulation. If you’re looking for something for training, consider buying this one. It comes with a padded strap that’s adjustable and comfortable. It doesn’t dig into the skin, causing any sort of discomfort. Plus, it even has an adjustable dial at the rear to tighten or loosen the grip. It’s more precise and gives the same amount durability without compromising on quality. You won’t feel the weight on your head, for as long as you wear it. And it’s easier to train in given the number of times you will twist and turn your direction. This ASTM-approved model offers a removable visor and high-flow vents to keep you cool and dry. The IRH Equi-Pro Helmet offering versatile and efficient features is not short of extraordinary. It is designed with a top-quality ventilation system that allows air circulation in and around your head. And backed by its tightening strap, this design is a good choice for anyone looking for a snug fit. It’s good enough for riders who tie a ponytail, which includes children and women. Plus, you can have this hat custom-fit, if that’s what you want. The price is also worth considering, given its high-quality and durable design. If you want something that’s lightweight and well-ventilated, you should consider buying this first. If our top pick is not of your preference, or you’d prefer something lighter, or you’d want a model with plenty of air circulation for sweat control, the IRH Equi-Pro is a good value for smart features. We found the Ovation Extreme Helmet by thorough research and testing. It is more goal-oriented, which means more easy to use and durable, than our previous picks. As the name suggests, it does take usability to the extremes. With a strikingly low profile and sharp appearance, it looks and feels like a top-performing candidate. The in-mold design is feature-backed with 2 of its most striking qualities: the stainless steel air vents and adjust dial. These features may sound simple, but they transform the way this helmet feels. It offers good protection against collisions and impacts. Meanwhile, the ASTM-approved design has minimal carbon footprint with a washable and patented CoolMax liner. Everything you hoped for in a stable and durable horse riding hat, this best one offers. It protects you from sharp objects regardless of your skill level and offers features that you may find the most helpful. If you want good features without spending a lot of money, the Troxel Rebel Performance Helmet is a valuable choice. We found the design of the helmet better than those with a high price tag. With a SureFit structure and Duratec finish, it boasts of durability right from the start. It’s ASTM and SEI certified for children and adults. It withstands everyday use, from riding to training. The best part about this contender is that it breathes well- all thanks to the honeycomb mesh-covered vents. In addition to its lightweight design, this pick is what you wear and forget that it’s on your head. The Troxel is a good brand known for their creative and efficient products. If you’ve had a history of feeling claustrophobic in such gear, buying this one will help you. The low profile of the helmet really sells itself. So you can forget about sweating or feeling cramped in protective gear moving forward. 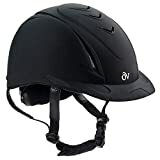 The Troxel Legacy Schooling Helmet is the best choice for children. It comes in an attractive design, ranging from black to blue to purple. With has a slim profile, much lightweight than previous choices, and backed by comfortable padding. The seams on both ends are reliable and made with a high-quality material for long term use. This best hat is designed in such a way that it reduces pressure off your neck, while stabilizing your posture. The internal padding of the headgear is also good, which doesn’t irritate the skin or cause heat buildup. Frankly, this pick meets every parents’ expectations for their child’s safety. With a removable headliner, DialFit system, and adjustable straps, this pick is useful for training as much as riding. It also ranks well for occupying minimal footprint which most of you will find extremely satisfying for portability and storage. Our last pick is specifically designed for children. It is the JOLIN Equestrian Knight Horse Helmet. This pick is unlike the rest of the competition with fewer design functions and extra-rugged features. Which makes it the perfect choice for kids. The breathable padding offers the best heat dissipation that ensures safety. This is important since a heavy-duty helmet can cause headaches quite often than not. So the lightweight design and sufficient vents make all the difference. The chin strap is made of high-quality and a comfortable material to avoid skin irritation. It’s also adjustable. But the circumference of the hat isn’t, so make sure you find the right size before buying. The competition for the best horse riding helmet was quite close. Horse riding helmets are more straightforward than you think. They work the best along with other important protection accessories such as gloves and boots. To pick the right one from the list, you need to measure your head size and understand your requirements. For that purpose, we’ve compiled this handy guide to help you get started. Below you’ll find all the commonly asked questions about them and their best answers. This, not to mention, is what you need to beat down the competition and find the best product possible. It’s nice to buy the best of the best product for your needs. To add to it, learning how to maintain one helps you save tons of time and money in the long run. If your headgear has a smooth plastic-like outer shell, it can be wiped clean using a microfiber cloth or a damp one. Make sure you avoid the use of strong chemicals such as solvents or laundry detergents to clean the exterior. It may deplete the material strength and the structure may break down due to the exposure. Strong solvents have a direct effect on the lining and material glues in such a gear. So use with caution. If you notice that the shine and color of the helmet is slowly, but continuously fading away, it’s time to replace it with a brand new one. This usually happens when the materials binding the headgear are breaking down after every use. The longest duration of use should be not more than 5 years. The internal components of a headgear suffer more from moisture, heat, and chemicals than the exterior. If you’re wearing a damp headgear, it means its effectiveness has completely gone away. On the other hand, if your hat starts to smell funny due to moisture and heat, try using a deodorizer to neutralize the smell. However, in some models, a deodorizer did more harm than good. The alternative is to allow the interior part of the gear to dry in the fresh air. You can place a deodorizer rock inside the gear and it should do the trick effectively. Another similar product that works effectively is liners. If someone told you that dishwashing your helmet is probably a good idea, do not listen to them. Washing your gear with soap and hot water can deplete material strength. A good equestrian headgear is composed of foams, fabrics, glues, and plastics; all joined together with the help of adhesives. By dishwashing with the best dishwasher, you’re weakening any one of those materials. So sticking to fresh air drying is a good choice for keeping your gear clean and tidy. Are you using a velvet helmet? Anyone using a velvet helmet knows how hard they are to clean. Especially when they become extremely dusty or damp. The best way to clean them is to use a soft brush to extract all the dust out of the lining. And a damp cloth to clean out the stains is good until you push the cloth into the material too much. So avoid overstressing your gear with too much pressure. You can even consider buying a stable headgear cover to prolong its shelf life. Some manufacturers allow washing the gear with mild soap and water. So read the instructions carefully before moving forward. Are safety standards important for wearing the best horse riding helmet? The most important thing you need to know about any equestrian helmet is the compatible safety standards. For example, in the United States, the most approved safety standard for equestrian gear is The American Society for Testing and Materials, or ASTM. This standard works and tests all sport equipment, including other industrial work equipment too. So when all equestrian gear is set, tested, and verified, it must go through this safety standard for the green light. Some of these standards, however, are not ideal for FEI level competition. FEI level competition means is Federation Equestre International. It holds all horses’ events including athletes and races. Only EN, PAS, and Standards Australia are some of the top standards that are suitable for FEI level competitors. With that said, if you’re a run-of-the-mill backyard rider, the international rules and regulations of FEI do not apply to you. In such a case, you still need to buy a good equestrian helmet that has been approved by any one of these standards. With FEI approved certifications, you can be rest assured that you’ve got a safe and durable helmet. Another significant aspect of safety standards for equestrian gear includes those products that have been designed specifically for show. And by show we mean for fashion apparels. Some helmets feature an “Apparel Only” or “For Dress Only” tag, which means they do not come backed by any safety standards certification. You can buy these helmets for their appearance, but not for their safety or function. Such equestrian gear is usually sold alongside those that are certified and safe for horseriding. Similarly, there is hardly much of a difference between each in price and quality. Studies show that many consumers fall for such falsified claims, while putting themselves at risk for serious brain injuries. Can I reuse the same helmet after a major impact/fall? No, it’s important that you replace your equestrian helmet after a bad fall. Even though there is no visible crack in the helmet, it is likely that you might fall on the same part of the hat again. And then, the hat will remain incapable of protecting you from the impact. So you have the kind of protection you need, you need to replace your gear for the best horse riding helmet after a major fall. To better understand why you can reuse helmets, consider the following explanation. Impact: Impact denotes how well your horse riding helmet absorbs the impact against harsh blows and collisions. This includes the impacts experienced from both sharp, small, and large objects. Such impact management is and should be the final result of an upgraded and unused equestrian model. Positioning: Positional stability of a product means whether the hat is in the right place, which is on the head, when absolutely needed. Positional stability is vital because it allows better adjustability as well as protection during a collision. These standards dictate the efficacy and efficiency of a model. You must ensure the product matches your head- allowing better stability as well as adjustability for the best fit. 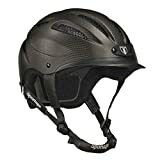 What are the different types of riding helmets? 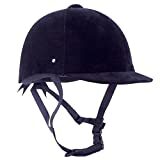 If you’re a horse rider, you only need an equestrian helmet, however, much knowledge on the other types of helmets is vital for your awareness of such intense and multi-purpose gear. Certified equestrian headgear, as mentioned previously, comes backed with safety standards including ASTM, EN, SEI, etc. These labels meet the needs of a durable, safe, and rugged helmet. And such approved headgear also come with the manufacturer’s seal of approval. This seal is viable for at least 5 years of use until it needs to be replaced by another model. However, during this span, if you meet with a major collision, you need to replace the headgear immediately. The reason why a standard equestrian headgear is in its best condition for 5 years is because sun exposure, sweat accumulation, and chemicals steadily deplete the Styrofoam padding that make the helmet weaker and brittle. This has a direct impact on the protective abilities of the headgear. Look for an equestrian headgear that covers the forehead, area above the ears, and the back of the head. In comparison, bicycle helmets only offer protection at the front of the head. Hence, they need not be used for horseback riding protection. Similarly, bicycle helmets come with plenty of vents that leaves parts of the head exposed. This compromises the protective and durable properties of the headgear. What are the correct equestrian helmet sizes? It’s important to think with your head when choosing the right equestrian headgear. And to do that, you need to know the best available sizes of one. Now, the right way to measure your head for equestrian headgear. Wrap a soft fabric measuring tape around your head. Pick the widest part of your head, which would become the accurate circumference of the head. If you do not know where to start, measure an inch above your ears and start from there. Tally the exact measurement, in centimeters, to the manufacturer’s sizing chart. I have a round-shaped head. Do I need a different sized headgear to suit the shape of my head? This is a common problem faced by many riders. Equestrian headgear is specifically designed for both oval and round-shaped heads. However, before finalizing a purchase, you might have to experiment with a few contenders, first-hand, to find the best fit possible. If the headgear squeezes any part of your head, especially your forehead or at the sides, it isn’t the right fit. If the helmet is easy to maneuver sideways and not front to back, then it is too round for your head. If the helmet is easy to maneuver front to back and not sideways, then it is too oval for your head. It should also rest comfortably on the top of your head, while covering all sides of the skull and exerting equal amount of pressure throughout. Make sure there aren’t any gaps at the side or the front and rear. If the headgear rises from your head, then you need a bigger size. On the contrary, if the headgear is so loose that it sits lower than your eyebrows, then you need a smaller size. The best way to determine the size is to wiggle the helmet front and back, up and down, and side to side. Only when the forehead and eyebrows move along with the help is when you have found the best fit possible. If it pivots your head, then it means you need a smaller size. With an adjustable helmet, which includes the chip strap, you can hold the headgear in its right place. But make sure the chin strap isn’t too tight that it causes discomfort bruises the skin. Opt for chin straps with sliding clips that allow better harness adjustments around the ears. Are horse riding-related injuries that severe? It’s important to explain the demographics and statistics of injuries related to or caused by horseback riding. That said, such information illustrates the importance and use of protective gear, such as equestrian headgear, in relation to preventing such injuries. After taking over 260 patients into record- all of whom suffered from equestrian-related injuries- the majority of patients experienced head injuries. Most were young and female, at least 84% of them. And remaining percentage of injuries were isolated head injuries. The bottom line is that there are many models to choose from. But the best of the best pick is the Troxel Spirit Riding Helmet. It is truly a smart choice for most buyers. And it does protect you from everything from small to large objects, sharp objects, and uncalled-for collisions. So everything you had imagined for your protection is possible once you buy this pick.